If China announces a limit on carbon emissions, could India follow? When countries unveil their plans for curbing carbon over the coming decade, the climate-conscious world knows that it wants to see aggressive, economywide cuts from the United States. Similarly, consensus is building that China, which now emits more carbon dioxide than any other country, should announce a peak year after which its emissions will fall. But what of India, the globe's fourth-largest climate polluter and yet also home to more than 400 million people who live on less than $1.25 per day and lack access to basic energy services? The question is a pressing one in the wake of Indian Prime Minister Narendra Modi's first Washington, D.C., visit, during which climate change featured prominently on his agenda with President Obama. While Modi has vowed to work with the United States toward a new global climate deal in 2015, the government has been playing its negotiating cards close to the vest. Meanwhile, others have been mum on precisely what they hope to see India contribute to that agreement. 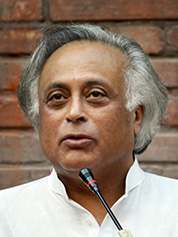 Jairam Ramesh, India's former environment minister. Photo courtesy of Wikipedia. "There's a fairly clear sense of what's expected of the U.S. and China," Jake Schmidt, director of international programs at the Natural Resources Defense Council, said at a recent U.S.-India Energy Summit. But, he said, "Many of the countries that I've talked to recently don't have a strong sense of what the ask is from India." One person who has given the matter a great deal of thought is the country's former environment minister, Jairam Ramesh. Now a visiting scholar at Harvard University's Belfer Center for Science and International Affairs, Ramesh led India's negotiations at the 2009 U.N. summit in Copenhagen, Denmark, causing friction inside his government when he insisted India should take on commitments. That call for leadership had run counter to India's longtime negotiating position, which holds that Western countries caused climate change and must bear the burden of the cleanup, aiding poor nations financially while also giving them an indefinite time to develop and the "carbon space" to pollute. Speaking to ClimateWire while in Washington, D.C., recently, Ramesh said that "moral" argument no longer holds water. "All countries must take on some type of responsibility. What that level of responsibility is, we can differentiate according to the level of development," Ramesh said. Echoing U.S. arguments, Ramesh said that the system of two camps created in 1992, based on that year's income data, of developed countries required to cut absolute emissions and developing countries encouraged to take voluntary actions is "ossified" and needs to change. When countries come forward as expected early next year to pledge targets for the years 2020 through 2025 or 2030, which will be folded into a deal signed in Paris at the end of 2015, Ramesh said, a new order must evolve. "There must be a graduation criteria," he said. "I don't see why, as countries move up the economic ladder, they shouldn't act. I don't see any reason why rich Middle Eastern countries shouldn't take on commitments. Why shouldn't Qatar take on mitigation commitments? Why can't Saudi Arabia? They're rich countries, and they can afford to. The notion that Saudi Arabia, Singapore, Qatar, South Korea can't take on commitments ... you've frozen the world in 1992." India, he said, should make "sensible" commitment for Paris. For example, he said the government could "very easily" vow that by 2030, the country's share of renewable energy will grow from its current 6 percent to at least 20 percent. With the cost of solar and other clean energy rapidly dropping, he said, "that's a commitment we can certainly make." The country can also pledge to improve the quality of its forests, as well, he said. Currently, he said, between 40 to 50 percent of India's forests are degraded, and the country should make a "firm commitment" to restore forest cover. He also pushed for an agreement to phase down the super-greenhouse gases hydrofluorocarbons, known as HFCs. He drew the line, though, at cutting absolute emissions. That, he said, is something that won't happen in India for many years to come. "My view has always been that India is not in a position to give a peak year," Ramesh said. "We have a long way to go. We have to provide electricity for millions of people. Peaking is a bit too premature in the India context." On that point, Ramesh is not far off from the Modi administration, whose environment minister, Prakash Javadekar, told The New York Times recently that while India may slow the rate of its emissions growth, that growth will continue for at least another 30 years. "India does have a right to develop," Ramesh agreed. "India's absolute level of emissions are not going to decline, but India's emissions intensity must come down." India, Ramesh said, should aim for what he called "China plus 20." He argued that India needs another 20 to 25 years of growth at 8 percent per year before it can think about cutting absolute emissions, but said there are plenty of other measures India can take without sacrificing that growth. Climate analysts in the United States agreed. Schmidt, for one, said what he hopes most to see from India is that the government "deliver real, transformational change on the ground" on clean energy and a change in the emissions trajectory. Reid Detchon, vice president for energy and climate at the U.N. Foundation, said he thinks too much emphasis is being put on the numbers connected to the pending pledges rather than substantive and immediate changes. "I would be very comfortable if India came forward with a plan to invest in clean energy on a large scale as its commitment," Detchon said. "I think that would be a great commitment by India." In its submissions to the United Nations, the Indian government remains steadfast in its insistence that developed and developing countries should remain in distinct tiers when it comes to the 2015 agreement, with developed countries taking on firm mitigation commitments and developing countries acting voluntarily in exchange for finance. It is a view that Ramesh said purposely turns a blind eye to the global gains that the heavily polluting United States has helped to bring about. "This is never said, but I don't mind saying it: The U.S. has not only contributed to emissions but has also contributed to unprecedented global prosperity. It has brought about technology innovation; it's introduced technological change. It also contributes a quarter of world GDP," he said. "You can bash on the U.S., but what about the markets the U.S. has provided? That's why this moral argument is a slippery slope." Ramesh said he is "realistic," rather than optimistic, about prospects for a new global agreement in 2015. But he cautioned that the Modi government may decide that taking on the United States is more popular than being a climate leader. "The probability of India being the last man standing cannot be ruled out," he said. "You become a hero domestically."